Some cosmetics are not only functional, but are so estheticly designed that I want to display it anywhere in the apartment and look at them all the time. That's me. 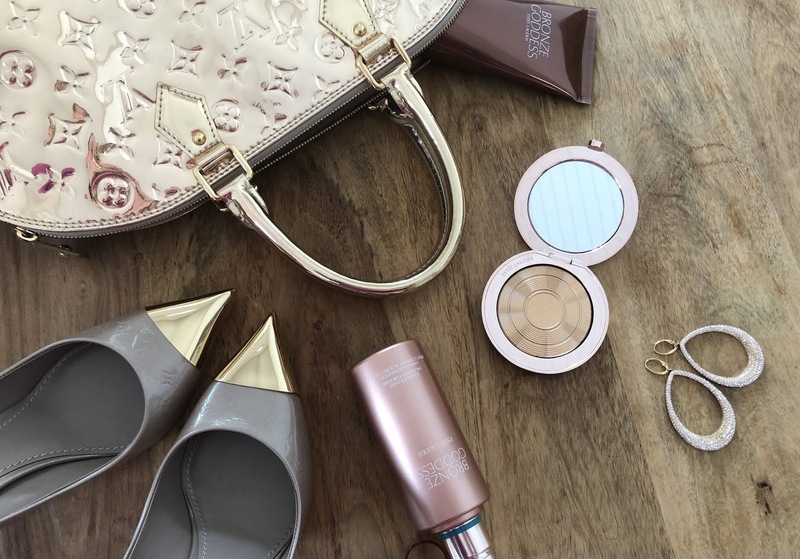 The Bronze Goddess is a summer collection by Estée Lauder. They are constantly coming up with something new and great. This time, my heart was overwhelmed when I looked at the Cooling Body Gelée. This transparent gel is beautifuly fragranted. It absorbs instantly after sunbathing into the skin and leaves it hydrated and fragranted. Try and you will love it. Summer and hair beach waves is The combination. You can do it really perfectly with Bronze Goddess Salt Spray For Hair. Easy, fragrant, beautiful. Mirror mirror on the wall... If you are tanned or not yet, the golden highlighter is always good to have. Imagine. Sitting in the garden, by the river, by the sea or on the yacht, you have a beautiful snow-white outfit, golden bracelets and earrings, face and revealed shoulders decorated with the golden highlighter from the Bronze Goddess collection. Would not you feel like a goddess? This highlighter is pure gold. Trust me. I touched it once, and I was overwhelmed by its shine and efficiency. Niektorá kozmetika je nielen funkčná, ale tak dizajnovo vymakaná, že si ju mám chuť vyložiť hocikde v byte a dívať sa na ňu, jak je krásna. To som celá ja. Bronze Goddess je taká letná kolekcia značky Estée Lauder. Stále prídu s niečím novým a vynikajúcim. Tentoraz moje srdce zaplesalo, keď som zbadala Cooling Body Gelée. Transparentná gelová konzistencia a krásne voňavá, telový gel po opaľovaní, ktorý osvieži, okamžite sa vstrebáva do pokožky a zanecháva ju hydratovanú a voňavú. Vyskúšajte a zamilujete si. Kto v lete nenosí beach waves akoby nebol. Tie ľahko docielite s Bronze Goddess Salt Spray For Hair. Dokonalé, voňavé, krásne. Mirror mirror on the wall... či ste opálené alebo ešte nie, zlatý highlighter je vždy dobré mať. Predstavte si. Sedíte na zahrádke, pri rieke, pri mori, či na jachte, máte krásny snehobiely outfit, zlaté náramky a náušnice a tvár a odhalené ramená vám zdobí zlatý highlighter od Bronze Goddess. Nepripadáte si hneď ako bohyňa? Tento highlighter je čisté zlato. Siahla som doňho len raz a bola som ohúrená jeho leskom. Neuveriteľné. Wow... The golden highlighter sounds awesome... Badly wanna try it ...!